This service is available in New Zealand but it can work out to be quite expensive at around $150 or so per session and you need many sessions. Having said this: If it works then it is worth every cent spent! How to Avoiding Cardiac Bypass and Stenting with a non-invasive procedure your doctor won't tell you about. I first learned of EECP from a talk given by Julian Whitaker MD at one of the large national medical meetings about seven years ago. (see video below). The concept is remarkably simple, and yet incredibly effective. 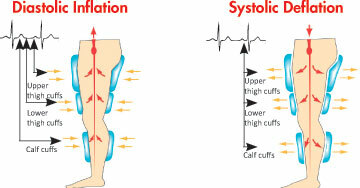 Blood pressure cuffs are inflated over the lower extremities in phase with an EKG trigger during cardiac relaxation (diastole). This pumps extra blood retrograde into the coronary arteries, which over time, stimulates collateral blood vessel formation. 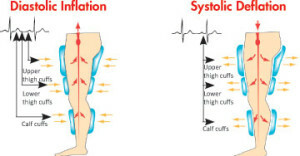 In patients with clogged or occluded arteries, these new collateral vessels bring a fresh blood supply to the ischemic , "at risk" myocardium. EECP is a drug free, non-invasive procedure that restores collateral blood flow to the heart of patients with occlusive coronary artery disease. A successful EECP treatment program means that patients no longer require the expensive hospital based procedures to open the coronary arteries, such as cardiac bypass, coronary artery stenting or angioplasty. Needless to say, mainstream cardiology is not too happy about the lost income.